Ferry crossing at Barra. Credit: James Courtright. resident Jammeh spent over two decades centralising power and sowing distrust. How do you rebuild a nation after that? How do you dismantle over two decades of repressive and corrupt governance in order to build a fresh democratic system? That’s the challenge currently facing The Gambia. Since Yahya Jammeh lost the 2016 elections and finally relinquished power under regional pressure in January 2017, the new government of President Adama Barrow has been trying to heal the deep scars left by the former dictator’s 23-year-long dictatorial rule and establish a “new” Gambia. The administration has a lot to do. Under Jammeh, a series of constitutional amendments made criticism of the government essentially illegal. In the judiciary, the president chased talented officials from the Ministry of Justice and appointed foreign “mercenary judges”. The National Assembly became a rubber stamp parliament that approved anything the president put before it. At the same time, Jammeh wielded the much-feared National Intelligence Agency (NIA) and paramilitary force known as the Jungulers to sow fear through unlawful killings, torture and arbitrary detention. To protect against possible challenges, he divided the Armed Forces by constantly moving soldiers around and filling the top ranks with loyalists. Since it came to office in January 2017 then, the government of President Barrow has had myriad challenges with which to contend. On the one hand, the government is trying to forge forwards in building a new order. The National Assembly is working to establish a team to consult the public and draft a new constitution to be put to a referendum. Foreign judges have been replaced with qualified Gambians in the judiciary. And at the justice ministry, staff are being trained up, while additional qualified and experienced lawyers are being sought. On the other hand, however, the government also needs to grapple with the past before it can go forwards. “We must understand what happened under Jammeh so we never slide back,” says Abubacarr Tambadou, Gambia’s Minister of Justice and Attorney General. In order to investigate how Jammeh amassed a fortune as president, a Commission of Inquiry was established this July. It has been investigating the financial relations between government ministries, companies and the former president. Its public hearings are being closely followed by the public and its mandate was recently extended by another six months. The government is also preparing to establish a Truth, Reparations and Reconciliation Commission (TRRC) to shed light on human rights abuses committed under Jammeh. The TRRC is slated to start touring the country early next year to record testimony from victims and perpetrators. Many are eager for justice as soon as possible, but some have raised concerns over what they see as a rapid time frame for rolling out the commission. Others have pointed out that the TRRC has not yet been allotted funding. Another key part of the government’s plans to build a new Gambia lies in reforming the security services. As Tambadou puts it, “if the judicial and legal sector was the brains of the old regime, then the hand used to perpetrate the atrocities was the security services”. As part of this strategy, President Barrow rebranded the NIA as the State Intelligence Services (SIS) within weeks of taking office, while nine former NIA officers are currently on trial. Ceesay and others have suggested that the agency could be disbanded altogether, but Maggie Dwyer, a researcher at the Centre of African Studies at University of Edinburgh, warns against hasty action. Challenges in reforming the military are exacerbated by frictions within the army. In July, at least five soldiers were detained in relation to allegedly “mutinous” WhatsApp messages. According to Gambian press, at least two of the accused were alleged to be involved in an assassination attempt of high ranking officers. In early October, an additional seven soldiers were discharged without a stated reason. Late last week, 12 soldiers alleged to support Jammeh were charged behind closed doors with a range of unknown offences. Dwyer says it’s to be expected that some members of the armed forces might still be loyal to Jammeh. “The idea that everyone would suddenly switch allegiance right away is not realistic,” she says. But the problem, she explains, lies in a lack of transparency in how these soldiers were removed. Some of those who were discharged say it was because they come from the same region as former President Jammeh, a region where he remains popular. Among the former president’s supporters, these discharges have only added to a building narrative of political, and increasingly ethnic, discrimination. Transitioning from 23 years of tyranny is a fraught and painful process. Uncovering the truth, righting past wrongs, and rebuilding corrupt institutions are all essential, but can lead to greater instability in the short-term. 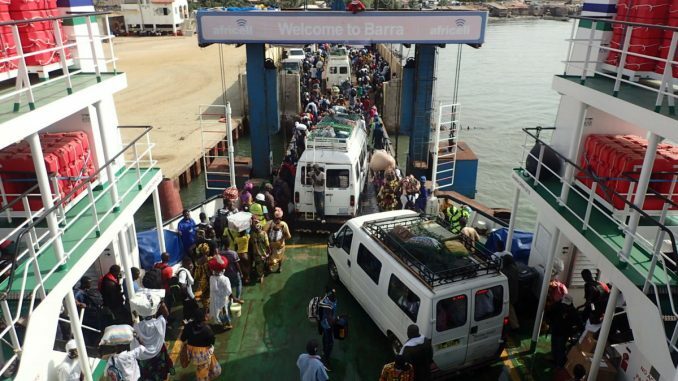 Since the start of the year, the government in Banjul has made some missteps and suffered from poor communication. But despite setbacks, observers suggest that it is pursuing the necessary reforms to avoid a return to the dark days of dictatorship, even if progress has been slow.